Today is not a standard Caturday of fun—I’m once again sat behind my lovely desk pounding away at the keyboard in a desperate attempt to meet my Monday deadlines. As I hit that afternoon lull that always greets me between 14.00–16.00, I contemplated a re-dosing of coffee before deciding to have a spot of afternoon green tea. I’m glad I did. 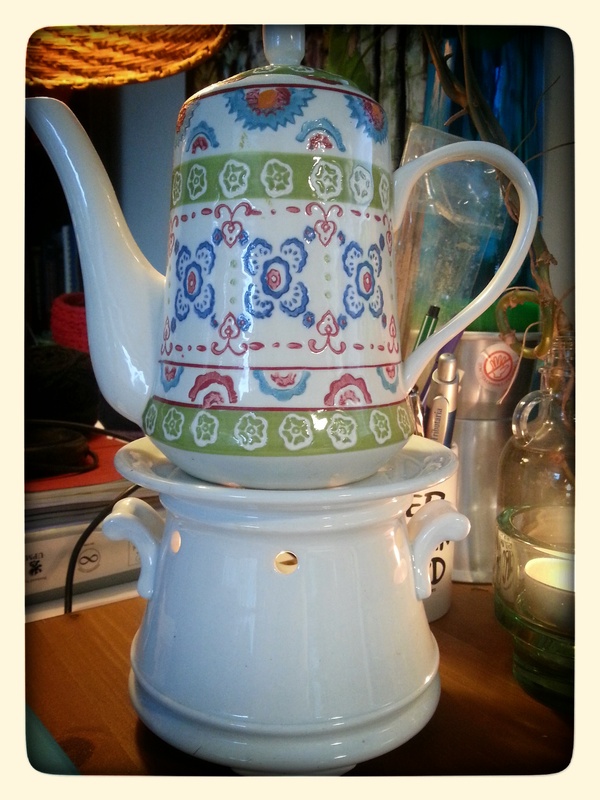 That first teapot warmer was found on our first outing to an antique market in Haarlem several years ago, which necessitated an insanely early morning alarm for someone who had imbibed a little too much the night before. (Nope. Wasn’t me. I swear.) These two darling friends took great care of me that day, and indulged my immediate infatuation with the idea of a teapot warmer by helping me score this beauty. Every time I use it, I am reminded of Christopher’s race to find the very best antiques. He searches carefully, keeping tabs on the behaviour and movements of his competitors and, then, swoops in at just the right moment to find that special something. It’s a lovely sight. Brad had told me that the closer we’d get to the market, the quicker Christopher’s pace would become. A more apt description I’ve never heard! It’s an incredibly fun way to spend a day, even if it does start early. And, reminds me of just how much The Cuban and I need to get to Amsterdam to visit all those friends we haven’t seen in far, far too long! But, today is also made special because of the particular tea in the teapot. Those same friends also turned me on to one of my favourite teas these days — Bigelow Mango Green Tea hits the spot on a chilly, grey winter afternoon. It’s so perfect, I might just go for two pots today.